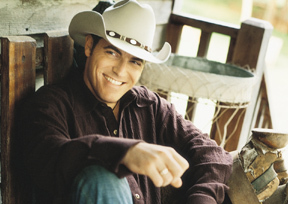 Meet, Country Music Singer, CCMA 2004 Rising Star, George Canyon from New Glasgow, Nova Scotia. George recently was runner-up to Brad Cottar, in the Nashville Star Television program. As a result of his 2nd placement, he was signed by Universal South in the United States. He began immediately to put together his debut CD with Universal South. As a result, the CD entitled, ONE GOOD FRIEND, is released to the public on Tuesday, Sept. 28/04. George with his roots in Nova Scotia, the hotbed of Celtic and Country music in Canada. He grew up with the sounds of Charley Pride, Hank Williams and Elvis Presley, his idols. Georges voice is suited to Country , and George says he loves songs that tells a story.He began playing guitar at age 5, and later in grade 5, he began singing in a school variety show. He wanted to learn to fly, but at age 14 he was diagnosed with diabetes and wasn't able to obtain a pilot's license. From then on, he decided to become a Dr., but during this time, he was told rules changed about the license to fly was now acceptable. But then he learned again that he was mis-informed. Finally he felt music was his calling, so he rekindled his passion for music. He won a lead role in Camelot as King Arthur and the show ran for 11 nights. During one of the shows, he met a Country Rock Band and accepted a role in their band, and as a result peformed for nearly 6 years. After the band broke up, he went solo and was married with 2 children by this time. For 9 years following, he held 3 jobs at once, performing in clubs at night, producing and engineering other artists and working as day as a police officer. He then released an independent album, cut 3 videos and even opened for Brooks & Dunn and Loretta Lynn. Finally in 2003, George was asked to audition for the Nashville Star Television series. As a result, he ended up as runner-up to Brad Cottar, and then was immediately signed to a contract with Universal South. George recently said, He never imagined signing that contract, would never happen to him. It was like beyond a dream . Word just received, that George will make an appearance at the Grand Ole Opry on Oct 1 & 2, 2004 in Nashville, Tenn.